Before I proceed with those criteria, I should highlight the purpose of the Root Bridge and why every other switch needs to get to it as quickly as possible. The main function of Spanning Tree is to prevent loops in a network especially when alternate or redundant links are configured. It therefore needs 1 switch that all other switches can connect to. When this is determined, it then further determines the quickest or most efficient path(s) other switches can use to get to the Root Bridge. If it must block redundant links, it makes more sense to block less efficient links for optimum performance. This then takes us to how the most efficient port is determined. The major focus in a switching environment is speed and efficiency. The switch therefore chooses the link it believes is the fastest and most reliable. Every link has a cost attached to it based on the bandwidth or speed of the link. The lower the cost, the more reliable the link. In Spanning Tree, the rule of thumb is LOWER IS BETTER! In essence, the shortest path (not in distance but in cost value), is considered the most efficient and most reliable path. Please note that, EVERY other switch in the network apart from the Root Bridge that PARTICIPATES in Spanning Tree will always have 1 port it designates as the shortest path to the Root Bridge. The shortest path is then LABELED the ROOT PORT. Once the Root Port is determined, the switch looks to see if there is another link or path to the Root Bridge. If any is found, the switch automatically blocks that link from actively forwarding packets (Hold this thought here!, I will elaborate more on this later when dealing with designated port). Imagine a tree and and pay attention to the root. Going back to figure 1, after the Root Bridge has been elected, the figure will look something like this. (Please refer to the article (Root Bridge Selection) if you need to review how the root bridge was selected. Our Root Bridge is Switch C.
Question is, why didn't Switch D block it's Gi0/1 since that's another path to the Root Bridge? 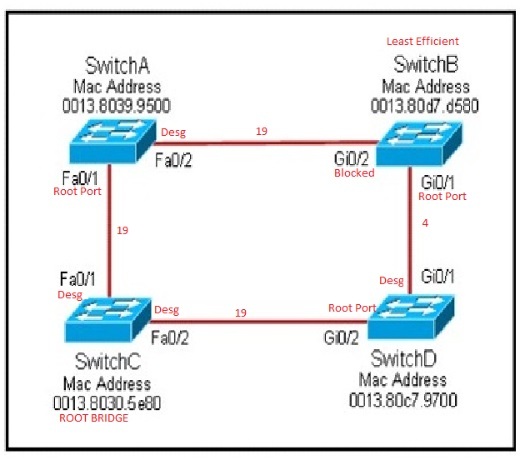 If you observe the Figure 3 very well, you will notice that Switch D's Gi0/1 port is connected to Switch B's Gi0/1 port which happens to be a Root Port also, meaning that, Switch D needs that link to access the Root Bridge. If you continue through path B for Switch D, you will notice that the link gets blocked eventually by Switch B at FGi0/2. I know it's getting a little more complex here but take it bit by bit and you'll be fine. You may also have wondered as to how the blocked port is determined. Why didn't Switch A block the link instead? Remember Spanning Tree's Lower is Better Slogan. Spanning Tree uses MAC Address or Priority value to determine which switch becomes the Root Bridge. The 1st criteria used is PRIORITY, then MAC Address if there is a tie in priority values. 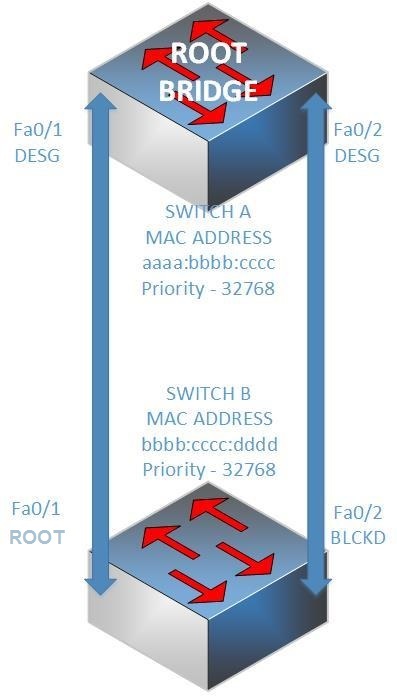 The Switch with lowest priority or lowest MAC Address becomes the Root Bridge (Master). Same concept applies to Blocked or Alternate Ports. The switch with the lower priority or MAC Address gets to keep it's port (since it is superior of the two). 1. Any port connecting to a Root Port will always be a Designated Port and is never Blocked. 2. There is no Root Port on a Root Bridge. 6. Designated Ports can pair with another Designated Port, but Alternate Ports can only pair with Designated Port. Take your time to sink this in. You may ask, Can a Blocked Port on a switch pair with a Designated Port on a Root Bridge? Great question, and the answer is YES. Anytime you identify a Root Bridge, mark all its ports as Designated, then look for paths other switches will use to connect to it. Only 1 path is allowed per switch to the Root Bridge. If 2 paths link to the Root Bridge, 1 link must be blocked, if 3, 2 links must be blocked; if 100 paths, 99 links must be blocked. The goal is to prevent a ring from forming between 2 switches. I hope this is clear enough. There are more concepts with respect to Spanning Tree but the goal of this article is to keep it simple and as basic as possible. Before I wrap up, I would like to touch up on one more possible but uncommon scenario. 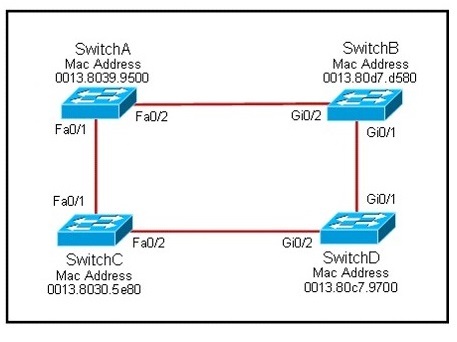 What happens with Redundant links between 2 switches? So, how does the switch determine which port to block? Back to our Spanning Tree Slogan, "Lower is better"
That's it, about Root Ports in its most basic description.